Alina, yeah my property sidekick, has been selected to go through the closed door audition for this year's New Paper Face. So this Saturday, she has to 'battle it out' with other gorgeous babes. Because I used to be one of the finalists a decade ago (MAK AI ANCIENT TU! ), she has been asking me for tips. And everytime I'll reply her this,"But babe, don't ask me, I'm like so outdated!" However one thing I know is, if we want something, we need to work hard for it. According to Bobby Unsher, success is where preparation and opportunity meet. Alina has been given the opportunity..now we need to prepare for this Saturday. Alina is also very blessed to have a troop to help her. Her mother to send her for facials. Tina to assist her with the catwalk. If there is one person I miss terribly since I have put on the hijab, that person will be my former hairstylist, Abang Sam. The only way to ubatkan the rindu would be to browse through pictures of Abang Sam's very satisfied customers' hair makeover pictures on Instagram and Facebook. Really miss his magic man. Kalau la dia Sam..antha..senang kan. Hehehe. ....my close friends and latest, Alina! Today, both Abang Sam and I surprised Alina with a hairmakeover session at: Glitz Hairworkz at TripleOne Somerset. Yeap, that's where Abang Sam is based at. Kalau nak stalk dia, sila lah! And as usual, Abang Sam did not disappoint. 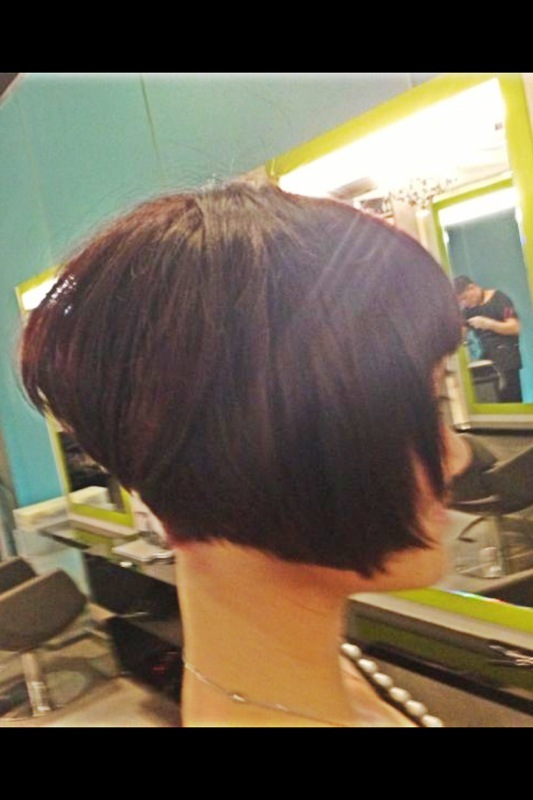 With this new style, Alina has been transformed totally. From sweet stuff to looking like one professional model already! So chic and stylo myloz kan.
Alina, we all wish you the very best for your coming Saturday's event! Jia you!!! If you make it to this year's New Paper New Face, we give our 100% support. Abang Sam, really, this talent of yours, I don't know how to describe. You are just amazing la Bang! Ladies, if you are bored of your current hair and really in need for a transformation, pls do yourselves a favour by making an appointment with Abang Sam. Now, if you're going for a one-off session, quote Nura J for 10% discount. If you sign up a package with him (you should actually since its advisable to trim/cut hair every 3-6 months! ), 20% discount he kasi lu. Any questions or you'd like to visit him besok jugak, please feel free to call or SMS Abang Sam at 90258774. E just returned from Penang (overseas school trip) last night. Great to have him back! Nyla has been sleeping with his unwashed shirt the nights he weren't here. I am also recovering from my fever/flu and the bad bodyache that came with it. My mom in law teased me last night. "Eh abang baru pergi berapa hari je dah demam." Since its the school holidays, I try my level best to balance work and family. Mornings settle work(the admin part).....Afternoons bring Nyla out for some fun...Evenings onwards, the viewings. Nyla is so into being mitchy matchy with me now. Just a few days ago, we had a huge quarrel about the lanyard. She is seen wearing the Hello Kitty one and sees it as an insult. Nyla: How come you never get Preeminent one for me? Me: You are a kid what babe. Cute what Hello Kitty. Nyla: Pls okay. I am already EIGHT years old. Wah kira dah terror ah. So my Division Director Raymond kindly gave another Preeminent lanyard. No more naggings already. Phew. Me: How come you put that picture?! Who wants to engage a baby seh to sell or buy their homes? Nyla: It's cute. People like cute babies. So if I use this picture, people will call me up because they cannot tahan. Many chapters have been closed the past few weeks for my sellers. When I represent my sellers, I try my level best to fetch the highest price for them...and then when they wanna buy, I try my very hard to fetch the lowest price for them. Anyway, at present, I personally feel that we have reached a "Cannot ask for ridiculously HIGH COV" stage. The past week has been pretty stressful for me. I know I am stressed when pimples say hello to my face. For those of you who have been following me on facebook, you all know about the CONTRA case kan.
Contra simply means selling AND buying at the same time. Pretty complicated but now that we have experienced and overcome it, ok liao. Man, so fast its the Weekend! Saturdays and Sundays are really the toughest days for real estate salespersons. I for one will be busy running around among 5 units. The Centris (looking for 3 more 2/3 bedders) for rent. I have also been blessed to have good chemistry with my clients whom I don't push ideas at. Instead they pull themselves in with theirs. Amazing! My waistline is also expanding thanks to my clients who tend to over feed me when I come to their houses. Sidetrack sikit. 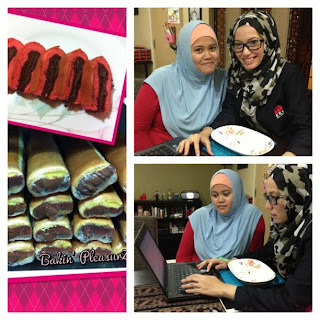 Attention korang korangz yand suka mamamz Tapak Kuda Nutella, please do check out 'Bakin' Pleasurz' on Facebook. Very OMG I cannot describe la. You must taste it yourselves to believe. Takkan la I nak cakap.."You kena masak k, baru I datang tolong you jual rumah you. Thanks. Bye!" Really,it is my duty to come to your place is to educate and update you on the current resale market before I proceed to sell your unit. I also have good news to share with you all. I MADE IT TO PREEMINENT'S WALL OF FAME for the month of MAY tau! I am very proud to be associated with one of the youngest and leading teams in ERA. This group is also very 'ON' with regards to conducting in house trainings. And being very kiasu, whenever I can , I attend. Step lifelong learner gitu. Heheheh! My gf, Shikin a.k.a sueetchic, called me up the other time. And that day's conversation has left an impact. "Babe, kerja tu ibadah....Sesuatu pekerjaan atau perbuatan itu akan dinamakan ibadah sekiranya mendatangkan pahala." Any property enquiries, pls straightaway call or SMS me at 97248866. If I don't reply your msges, call me up and roar,"NURA J! HOW DARE YOU NEVER REPLY MY SMS?!" Half a year passed just like that seh. I'm abit stressed because I really must make sure Nyla is having her well deserved fun with me during the June holidays. Today I felt a little guilty. You see...Every Monday I am attending real estate lessons conducted by my group. As much as I'd like Nyla to tag along, really cannot la. 10am all the way to 4pm somemore. She spent some quality time with my parents who dropped her off at Choa Chu Kang because Nyla wanted to play with her cousin at his place. Nyla and I really can lepak there for hours. Great time as usual. Already past midnight and Nyla is still reading her Secret Seven book. Gasak dia la. Tomorrow also no school....She's already at Book 3.So those of you whose children are around Nyla's age, you might wanna give Enid Blyton's Secret Seven series a shot. Hokay! 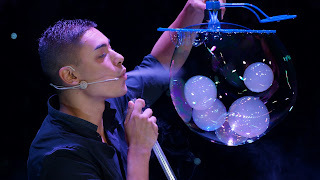 The purpose of this entry is also to share with you allz about Resort World Sentosa's "The Bubble Legendary Show". The Bubble Legendary Show is a magnificent and unforgettable theatrical experience with truly breathtaking and visually stunning effects never seen before. Created by Fan Yang, the World's greatest Bubble Artist holder of 18 Guinness World Records. 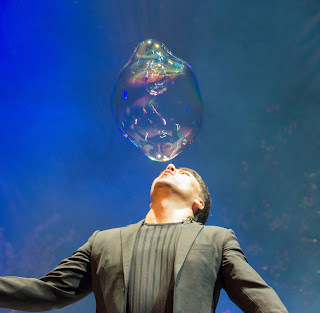 The highlight of the show is a beautiful masterpiece feature combining bubble art and the ultimate laser technology with the world's first silver, gold and 3D lasers titled "Legend of the Silver Sea". Launching at the Resorts World® Sentosa – Festive Grand™ Theatre real soon. 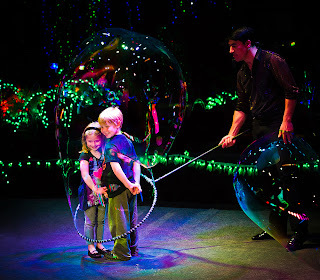 6th – 9th June 2013, the Bubble Legendary Show promises to be a captivating and interactive show suitable for audiences of all ages, perfect to spend time as a family this June holidays. If you book your tickets for the show between 11am to 3pm, you will be entitled to a Time-Limited Offer which allows you to get a FREE child ticket with the purchase of 2 adult tickets. You can book their tickets at http://www.rwsentosa.com/language/en-US/Homepage/ThingsToDo/TheBubbleLegendaryShow. Since I have allocated 10am to 2pm for viewing this Sunday, my slot will be at 3.30pm. So if our timings same same, hurray hurray! Hehehe. Have fun at Sentosa!